Our Music Workshops have gathered together a number of the top music teachers from around the country and run over both Saturday and Sunday in various rooms throughout The Cavan Crystal Hotel. 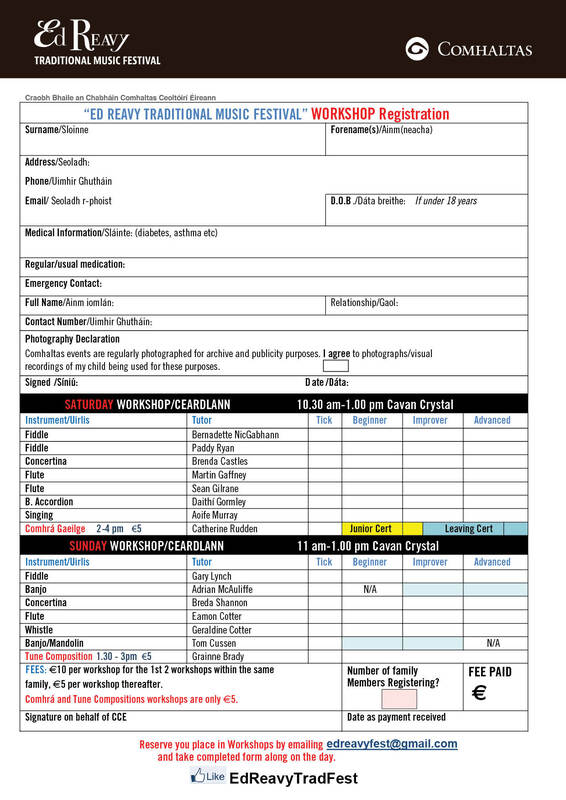 Registration: Please your place for your chosen workshop(s) via e-mail to edreavyfest@gmail.com and then print off and complete 1 form for each person and take to Ed Reavy Information Desk in Cavan Crystal on the day of the Workshops. Please note that The Fiddle workshop on Saturday morning has been changed from Paddy Ryan to Aoife Cunningham, Senior All Ireland Champion 2015, due to circumstances beyond Paddy’s control. Family Rate: €10 per person for the first 2 workshops and €5 per person thereafter within the same family. If you click on one of the names of the tutors, a new page will open with a U Tube clip of the Tutor playing a selection of tunes. Gráinne has been composing music for over ten years and has written a wealth of tunes to date. She completed a “tune a day” challenge over two months in 2009 and a “tune of the week” project over three months in 2014. On top of this she is regularly commissioned to compose music for weddings and various events or milestones. This music generally takes the form of a 32 bar tune, be it a waltz, dance or a lively jig or reel. The name of the piece is chosen by the commissioner and once the tune is composed, it is scored out and framed. In October 2014 Gráinne attended the much anticipated Distil residential weekend at The Mill Hotel, New Lanark. Laid within beautiful landscape and fine scenery, it was hard not to relax and enjoy the peaceful surroundings. Other musicians taking the course along with Gráinne, were Emma Tomlinson (fiddle), Laura Wilkie (fiddle), Neil Ewart (fiddle), Cameron Maxwell (double bass), Chris Greive (trombone), Kaela Rowan (voice/guitar) and Callum Armstrong (small pipes/recorder). Workshops were lead byJacky Molard (Breton fiddler/composer), Dave Heath(flautist/pianist/composer) and Raymond MacDonald (saxophonist/improviser). Leading the entire weekend was Simon Thoumire (Hands Up for Trad) and David Francis (The Cast). Hear some of the Tutors Play by clicking on their names above.